I don’t often drink white teas, but I opted for DavidsTea’s Bai Hao Yin Zhen when I had a Frequent Steeper reward to use (I usually save those for the more expensive teas to try out). This tea is quite light and airy, I got my 50g of this tea in a larger bag than usual. The leaves themselves are quite long and pale in colour, if you touch them you can feel how soft they are because the leaves have a light layer of fuzzy down that adds to the silvery colour. DavidsTea’s description of the tea that it “is a true luxury”. At $14.90 for 50g, it is not one of their most expensive teas, but it is on the higher end of their prices. 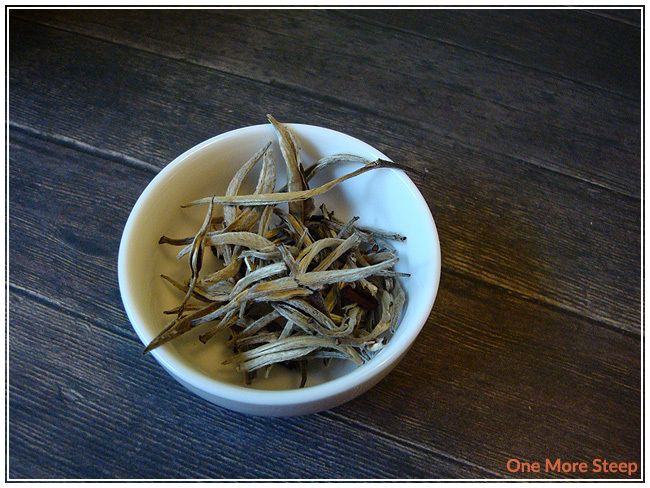 Bai Hao Yin Zhen’s ingredient list is simply “high-grown white tea from the mountains of Fujian Province, China”. 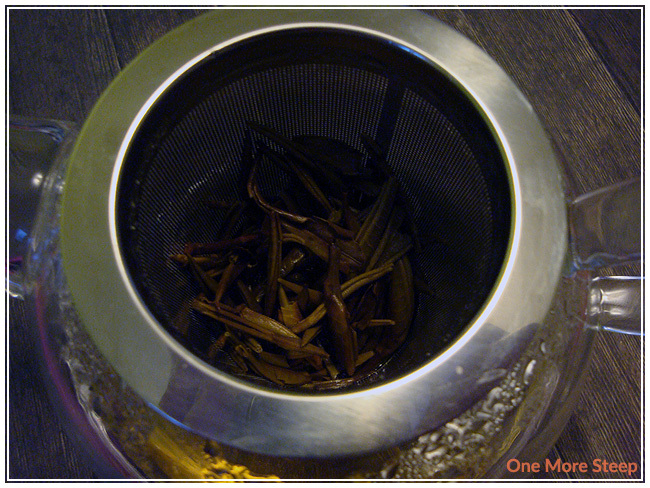 The dry tea leaves have a sweet honey smell to it, and also has very subtle hints at a grassy/vegetal fragrance. 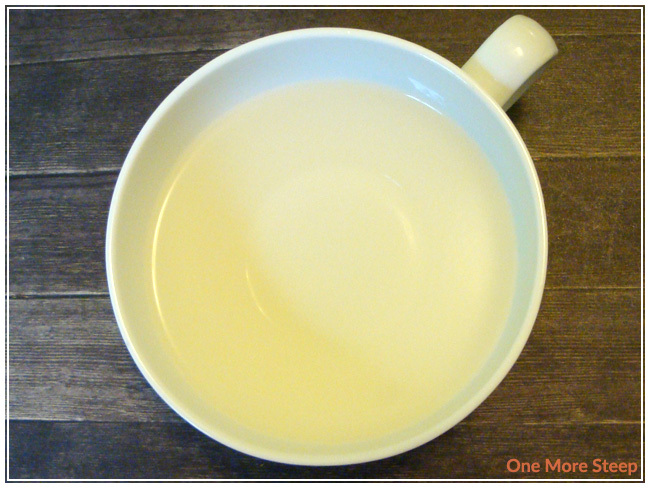 DavidsTea recommends steeping Bai Hao Yin Zhen in 90°C (194°F) water for 4-5 minutes. I consider that suggested water temperature to be too high for white teas, I opted to steep in 80°C (176°F) water for close to 3 minutes. Bai Hao Yin Zhen steeps to a beautiful pale, golden yellow colour. The smell of the steeped tea reminds me a lot of grass and dry hay. On first sip, the tea is smooth. There’s a very mild sweetness with a light taste of grassy notes in each sip. There’s zero bitterness, and it’s overall a very nice cup of tea. The flavours aren’t particularly strong, but I have never found silver needle to be the type of tea that you make and have on the go, it’s more of a tea that you have to relax with and sip. The silvery down layer of the tea leaves isn’t visible after being steeped, the leaves open up and they’re a bit of an olive green. Bai Hao Yin Zhen resteeps well! I resteeped the same leaves four times in my tea pot and the flavour improves for the second steeping (the flavour is richer, a little bit stronger, and the colour is a deeper golden yellow). The flavour holds true for the third steeping, but doesn’t hold out very well for the fourth steeping. So overall, I found that Bai Hao Yin Zhen resteeps well for two additional times. 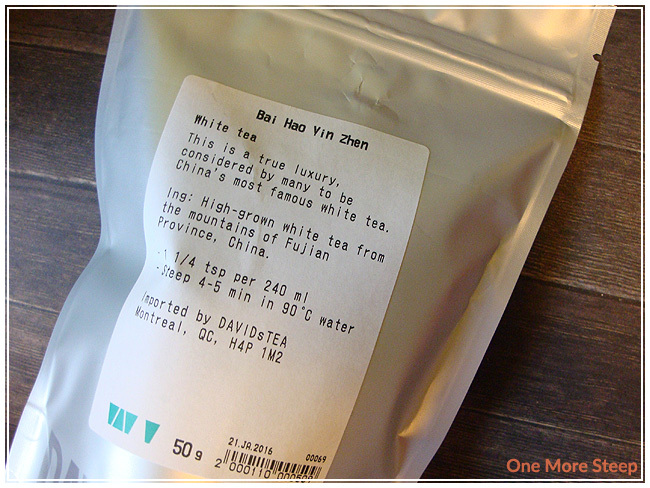 I liked DavidsTea’s Bai Hao Yin Zhen. I think it’s a nice quality silver needle and it makes a great cup of tea. It resteeps well, something I always appreciate when the tea is on the pricier side of things. I gave Bai Hao Yin Zhen only three cups out of four because of the steeping directions given by DavidsTea. Their directions are much too long and too hot for a white tea, something that would probably result in a lackluster cup of tea for someone who followed the directions to the letter (and would be disappointed by their Bai Hao Yin Zhen, considering how pricey it is).